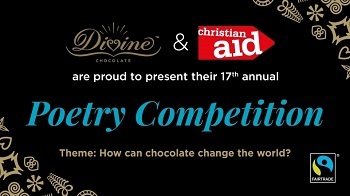 Divine Chocolate and Christian Aid's are proud to present their 17th annual poetry competition. The theme is "How can chocolate change the world?". The call is for you to fire your imagination and spark your creativity for the Divine Chocolate annual Poetry Competition in partnership with Christian Aid, taking adults and children alike on a voyage of discovery through the world of chocolate, cocoa farmers Fairtrade and poetry. The deadline for poems in English is 14th June 2019 and in Welsh is 30th April 2019.